The Texas Examinations of Educator Standards (TExES) Speech 7-12 exam is used to evaluate teaching candidates’ requisite knowledge, skills, and abilities as entry-level grades 7-12 educators in the Texas public school system. Teachers in the State of Texas are required to adhere to strict educational frameworks developed to ensure Texas students receive a high-quality education. The TExES Speech 7-12 exam was designed to allow the standardized evaluation of these specific test frameworks in all potential educators in this particular field. Typically, to sit for the TExES Speech 7-12 exam, you will have completed a bachelor’s degree program through an accredited educational institution recognized by the Texas Higher Education Coordinating Board. Additionally, you will need to have completed a teacher preparation education program or have arranged alternative means for licensure as outlined by the State of Texas. Please note: sitting for the TExES Speech 7-12 exam may necessitate authorization from your teacher preparation program; check with your teacher preparation education program prior to registering for any TExES exam. How much does the TExES Speech 7-12 exam cost? The TExES Speech 7-12 exam costs $116. This fee is payable by debit or credit card subsequent to online registration. Exam registrations will remain valid for up to 170 days. If you let your registration lapse, fail to show up for your scheduled test, or cancel your test without submitting a withdrawal request, you will not receive a refund. If necessary, cancelations must occur at least 48 hours in advance of your test date. Subsequent to canceling and completing a withdrawal request, you will receive a refund, less a $25 fee. What is the passing score for the TExES Speech 7-12 exam? The passing score for the TExES Speech 7-12 exam is 240. Your official score report will be available within 7 days of your exam date. Visit the TExES website for details regarding score reporting dates, which are dependent on the date on which you took the exam. If necessary, you will need to wait at least 45 days before retaking the exam. What does the TExES Speech 7-12 exam cover? The TExES Speech 7-12 exam is a computer-administered test (CAT) comprised of 100 selected-response, or multiple-choice, questions. Within the 100 multiple-choice questions, there will likely be several unscored pilot test questions. Because you will not be able to distinguish between scored and unscored questions, pace yourself and answer each question to the best of your ability. You will be allotted 5 hours to complete the exam, including 15 minutes for an initial CAT tutorial. The best means of guaranteeing you pass the TExES Speech 7-12 exam on your first attempt is to methodically prepare using the most comprehensive test preparation materials you can find. 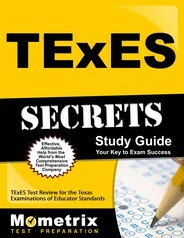 Mometrix Test Preparation has included just the materials you need in the TExES Secrets study guide. The TExES Secrets study guide includes real TExES content, step-by-step video tutorials, and expert tips for reducing test anxiety, improving memory, and passing the TExES Speech 7-12 exam on your first attempt. 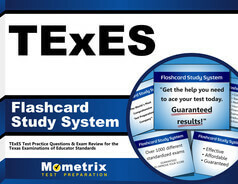 In addition to the TExES Secrets study guide is an in-depth TExES Practice Test and a complete set of TExES Flashcards. Take the most direct path toward realizing your goals: read the TExES Secrets study guide, test your knowledge with the TExES Practice Test and TExES Flashcards, and pass the TExES Speech 7-12 test on your first attempt.